Daily Current Affairs Quiz - 23rd April 2018 have a set of 15 questions which are important for the upcoming government examinations of Bank, Rail and SSC. These are very vital and have been provided with explanation and answers against each of the questions given here. 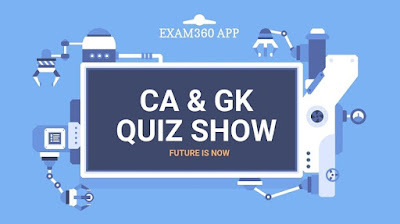 Aspirants should follow these and may also go through the Daily Current Affairs Quiz and Static GK and One Liner for reference before practicing. World Earth Day is an annual event celebrated on April 22. Q2. Name the human rights lawyer who have been named by Fortune magazine as the World's Greatest Leaders of 2018. Richest Indian Mukesh Ambani and human rights lawyer Indira Jaising have been named by Fortune magazine as the World's Greatest Leaders of 2018. Q3. Which actress ranked among TIME's 100 Most Influential People? Q4. Which bank has introduced a 'digital form' which will help open current accounts in a few hours. ? Private sector lender ICICI Bank said it has introduced a 'digital form' which will help open current accounts in a few hours. Q6. Which State approves accidental insurance cover for accredited media persons with yellow cards? Q7. which state announced 2% quota for sportspersons in government jobs? Telangana Chief Minister K Chandrasekhar Rao announced 2 per cent reservation in state government jobs for sportspersons. Q14. which state topped for the best Gram Panchayat in the country? Bengal has once again topped in the country with Digambarpur Gram Panchayat (GP) bagging the Centre's award for the best GP in the country. Q15. Name the IT Company To Touch 100 Billion Dollar Market Value.